Meet the Mos Burger. The Mos Spicy Burger to be specific. I love Thai food, from som tam (Papaya salad) to banana flower salad to chicken in holy basil to the curries. The hotter the better. It impresses the Thais that I’ve had meals with that I don’t order my food mai phet (not spicy). Only once did I end with a curry I couldn’t handle. I was in Pattani working on a story about the Muslim insurgency and I had lunch in the Officers’ Mess in an army camp I was visiting. They served one curry that melted my spoon. The army captain who was my host with nearly bust a gut laughing when I took the first bite. To this day I am convinced it was some kind of a joke since no one else even tried the curry. But every once in a while I want something “normal” for lack of a better word. I try to avoid the burger chains in the US and I certainly am not going to frequent them when I travel (except for drinks at the McD’s in the Red Shirt protest area, but that’s an exception). The other day I had a craving for a burger while I was on my way back to my apartment. I went into the mall near the apartment and saw a Mos Burger, which I discovered is a Japanese chain. At least it wasn’t BK or McD, which are as ubiquitous here as they are in the US. I tried the Mos Spicy Burger. Not quite as a normal as a Big Mac but not your standard Thai fare. Well it turns out the Mos Spicy Burger is darned tasty. 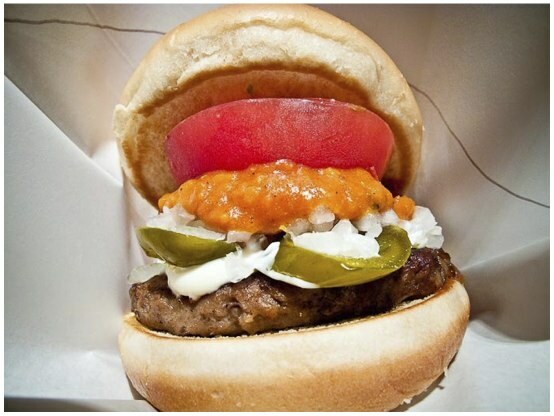 A reasonably good sized burger patty with a huge tomato slice, some mayo (the weakest part of the whole construct) some jalapenos and an allegedly spicy chili sauce. I say allegedly because on a Spicy Scale of 1 to 5 it weighs in at about 1.2, in other words very innocuous, but when you’re craving normal it’s great option. There are more photos from Thailand (but not of the Mos Spicy Burger) in my PhotoShelter archive and available from ZUMA Press.